The SWAT-Tourniquet™ is a unique and multipurpose dressing. Its name provides a description for usage Stretch, Wrap, and Tuck, but also the communities for whom it was developed - military and civilian Special Weapons and Tactics teams. These teams operate in an environment that has a high incidence of penetrating trauma, and most (two-thirds) of preventable deaths in the operational environment are from extremity bleeding. The SWAT-Tourniquet™ allows a more rapid means to control extremity bleeding, and allows application higher into the groin and axilla than other tourniquets. Its ease of application is one of its greatest benefits; individuals can effectively apply it in seconds with little to no prior training. At a third of the cost and weight of other combat used tourniquets, this tourniquet should find its way forward with every tactical operator. The SWAT-T™ is a latex-free multipurpose device! Other tourniquets are a one-use device. As we know the operational environment requires personnel and equipment to be both durable and versatile. The SWAT-T™ is a durable tourniquet. It has been advanced aged and heat/cold tested. This device will not fail! A tourniquet is to be applied when bleeding is severe (arterial) and loss of life is of greatest concern. In most patients, tourniquets have proven to be safe for a minimum of two hours, and for up to 6 hours without problems. When used properly all tourniquets may cause loss of limb. This is a necessary risk, to bring our patients home at the end of the day. The SWAT-T™ can and should be used as a pressure dressing,when hemorrhage is to be controlled, or for venous and capillary oozing. Place your sterile dressing (or standard gauze) then wrap the SWAT-T around the extremity. You can then tuck or tape the end, which will maintain pressure on the wound (preventing further contamination and re-bleeding). If the endpoints are met on the dressing you may have a tourniquet and should check for good blood return in the extremity (pulse and capillary refill), or you risk the complications associated with all tourniquets. Pressure dressings should be left in place until definitive wound management can be accomplished. 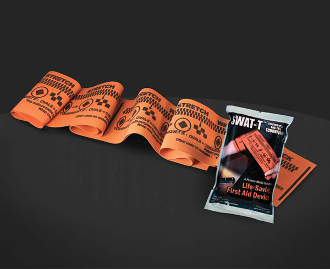 The SWAT-T™ can and should be used as an elastic bandage (example: ACE Wrap). Use the dressing to hold ice near sprains and strains, stabilize a twisted knee/ankle, or to sling a shoulder. The dressing can also be used to loosely apply pressure across the chest or abdomen. This can be to help close and protect wounds, contain abdominal contents in evisceration, or to assist in stabilization of the pelvis in blunt pelvic trauma. The SWAT-T can be used to splint an extremity to the body, other leg, or to a rigid object for immobilization. The SWAT-T™ was developed by a former Operator/Medic with 14 years experience in Operational Medicine -former USAF Para-rescue Journeyman (Para-Jumper or PJ)), Contractor DOJ/FBI SWAT Operations, National Registry Paramedic, and Emergency Medicine Physician. Product dimensions (before stretch): 4" x 56"